In the spring of 1960 I met a young English clarinetist in a jazz club on the Left Bank in Paris. When I told him that I was about to visit London for the first time, Chris, the young clarinetist, gave me helpful advice about social life in England. He told me the opening and closing hours of English pubs, the kinds of beer one ‘normally’ ordered inside a pub: ‘bitter’ in the public bar, which was frequented by the working class, and ‘lager’ in the saloon bar, the haunt of a ‘posher class’ of people. 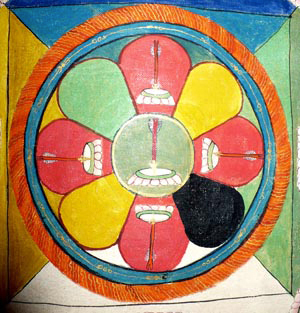 Visual codes of class divisions in England were more defined at that time, the early 1960s, before the advent of Flower Power. It was not rainy when I arrived in England at the beginnig of May in the year 1960. In fact the spring that year was sunny with the occasional balmy breeze which made venturing outdoors a pleasant experience. 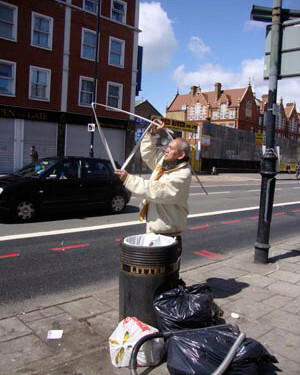 The words of Chris, the clarinetist, about the vagaries of the English weather, came back to me, after so many years, on May Day this year, 2010, when I sallied forth with Adam Nankervis from the flat of Fritz Stolberg and Nissa Nishikawa in Dalston, north London, to Soho Square, for the Opening of LONDON BIENNALE 2010. The morning began with some rays of sunshine, but by five in the afternoon, when Adam and I reached Soho Square, rain was pouring in slender slivers of cold water made silvery by the light from the grey sky. 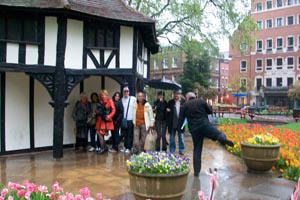 Indeed it took a certain kind of courage to brave the rain and come to Soho Square that day. As soon as Adam and I reached Soho Square at precisely five in the afternoon, there arrived shortly afterwards several LBAs (London Biennale Artists): the first was Marko Stepanov, whose cigar, alas, could not be lit and smoked in the drizzling rain. Marko, however, for this slight setback, by posing as a live full-grown Eros on the soggy green grass of Soho Square, a few metres away from the worn stone statue of King Charles the Second. Marko enacted a moving ephemeral tableau vivante. A couple of young Italian artists, Sergio Barberini from Rome and Sylvia Amorino from Milan, soon arrivee and took shelter from the rain under the Tudor-style garden house in the centre of the square. Filipino artist and curator Rico Reyes III arrived, followed by English artist James Early. Rico Reyes is currently doing his Master’s in Art degree at Goldsmith’s College. James Early has been involved in activities at the Pump House in Battersea Garden. Two other graduate students at Goldsmith’s soon joined us: Hyaesook Yang from South Korea and Ayako Fukuudi from Japan. Soon thereafter came Serbian artist Ana Milanovic and Finnish photographer Ritva Raitsalo. I remarked to artist and curator Peter Lewis and Japanese curator Makiko that Soho Square that afternoon reminded me of certain woodcuts of working men and women struggling in the rain in Edo (old Tokyo) by the great ‘ukiyoe’ artist Hiroshige. I also recalled that afternoon the paintings of Parisians holding umbrellas by Renoir and Caillebotte. Joanna Jones and Clare Smith, holding their beautiful ‘Eros Arrows’, walked down the wet stone path between the bushes aglow with bright spring flowers, towards the garden house. Clare and Joanna came down from Dover especially to attend the inauguration of LONDON BIENNALE 2010. 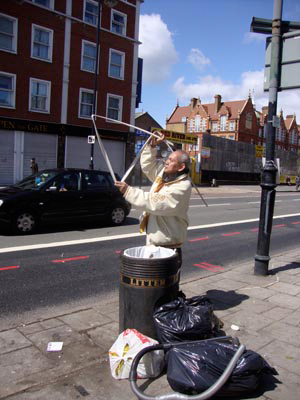 During LONDON BIENNALE 2008 they organised ‘Pollinations’ in Dover. Arvinder Bawa, London Biennale’s emeritus web-master, called me from his cell phone and said that he was inside the Angel Pub and other LBAs were already there waiting for those of us at Soho Square. So, in twos and threes, we made our way to the Angel Pub. The Angel Pub is next to St. Giles Church behind the tall Centre Point Building on Tottenham Court. At the start of the first LONDON BIENNALE in the year 2000, after gathering at Soho Square, LBAs walked to Borders Book Shop on Tottenham Court Road. Inside Borders Adam Nankervis opened the first LONDON BIENNALE. After Adam’s inspiring welcome speech, Anthony Heywood, the head of the sculpture at KIAD University of Canterbury, inflated his world map balloon sculpture which the audience passed from hand to hand. Then several artists showed their films and videos in the bookshop. In the year 2002 (the second LONDON BIENNALE) German artist Andreas Uhl found another venue for us to meet and hold congenial conversations: the Angel Pub, which has been, more or less, the meeting place of LBAs from that time till now, except in 2008, when the LONDON BIENNALE opened at the foot of the Eiffel Tower in Paris. Incidentally, Andreas Uhl enacted a marvellous semaphore performance in 2002 on the empty plinth at the corner of Trafalgar Square, many years before YBAs used the same plinth to display their art works. The area around Tottenham Court is currently undergoing a lot of new building works. Borders Book Shop, alas, is now gone. Across the road from the Angel Pub there now stand new colourful buildings designed by the architect Renzo Piano. 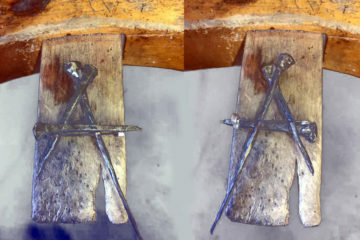 When Adam Nankervis, James Early and I arrived at the Angel Pub last May Day 2010 we were pleasantly surprised to see that the work of renovation was in progress inside the saloon bar. We entered the adjacent smaller public bar whose walls are now covered with a William Morris wallpaper. 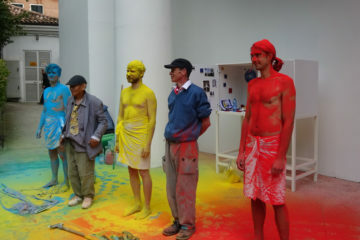 Several London Biennale artists were already there, engaged in spirited conversations. The acoustic of the small public bar meant Adam had to do his welcome address in silence in telepathic and telekinesthetic fashion. Arvinder Bawa, our web-master emeritus, was soon joined by his son Anil, who is doing his doctorate’s degree in mathematics at University College London. Photographer Emre Soykan brought along his fellow photographer and fellow Cypriot friend Huseyn Kaptan. Lindsay O’Nions and Cyril Lepetit came with their beautiful baby Lottie, another young addition to the babies of London Biennale artists. Cyril was busy preparing for his solo show at the Danielle Arnaud Galllery in Kennington. The international composition of the London Biennale was evident in the small space of the saloon bar of the Angel Pub that evening. Among those who braved the rain on that May Day were: Francesca Di Fraia from Napoli and her friend Giovanna Baiano; (Francesca is a friend of painter and video artist Lello Lopez, who made a video of an impromptu performance I did in the cave of the Sybil at Cuma); Joanna Jones and Clare Smith of Dover Arts Trust; Elisabetta Fumagalli, originally from Udine, now based in South London; artist Roberta Kravitz who travelled to the Atacama Desert in Chile with Adam Nankervis; story teller and labyrinth maker Nico Pollen, who was the Green Lady in LONDON BIENNALE 2002; young handsome bright English artist James Early; Mexican poet and artist Mabel Encinas, curator of thre exhibition in honour of Paulo Freire at the Institute of Education in London during the Latin American Cultural Week; Durba Hailey; Jack Gillis, Sebastian Beshy and Adam Ball, young artists and designers from Manchester; Portuguese writer and art impressario Marco Soares; Toto de laCruz; photographer RitvaRaitsalofrom Finland; Marko Stepanov, polymath artist and allotment gardener; DeboraMo; Kullbinder Johal; Ayako Fukuudi from Japan; Hyeessook Yang from South Korea; performance artist Ana Milovanovich bfrom Bosnia; Kat Levik; David Stoker, collector and curator of beautiful drawings by Sir Francis Rose, the ‘adopted son’ of Gertrude Stein and Alice B. Toklas; artist and curator Jill Rock, who organised recently the ‘Equinox’ events at The Foundry on Old street; Echojak Mysko; painter Margaret Atkinson; Filipino artist and curator Rico Reyes III; Andrea Rossi from Milan, who has lived in London for several years now; suring London Biennale 2002, Andrea Rossi participated in Adam Nankervis’s ‘Flotsam/Jetsam’ event on the south bank of the river Thames in front of Tate Modernin which Adam retrieved debris from the flowing water which he arranged into a visual poem on the bank at low tide; Kate Fallon-Cusinsand Claire Freeman came down from Liverpool, wearinglovely white T-shirts printed with the words LONDON BIENNALE 2010; responding to Adam Nankervis’s SIGNALS proposition, Claire Freeman made 200 prints of her photographs and Kate Fallon-Cousins made 200 individual collages which they will distribute in London and Berlin; dancer Simon Shirley arrived from Nairobi, Kenya, on May Day proceeded directly to the Angel Pub; art historianand curator Guy Brett who recently curated theVantongerloo exphibition at the Reina Sofia Museum in Madrid; Chinese-German artist Alma Tischler and her partner Professor John Wood. Alma and John will leave soon for an eight-month stay in South Korea. On the eve of their departure from England, I will organise a boating party from Westminster to Deptford where Alma Tischler Wood has created amural facing the river Thames. That event, which willdeaturea symposim on the Thames, will be a farewll part for Alma and Hon. It will take place on the last Saturday of August 2010 (August 28). 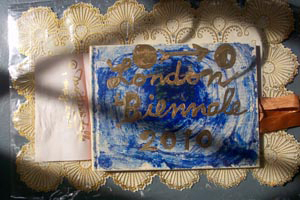 It will also be the English finale of LONDON BIENNALE 2010. You are all invited to come. 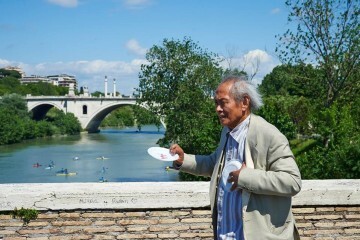 David Medalla is a Filipino international artist, who was born in Manila, the Philippines in 1942. 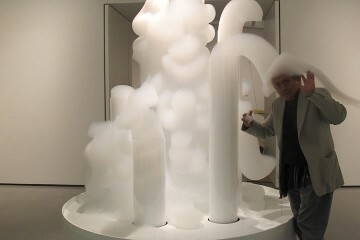 His work ranges from sculpture and kinetic art to painting, installation and performance art. He lives and works in London, New York and Paris. At the age of 12 he was admitted at Colombia University in New York upon the recommendation of American poet Mark van Doren and studied ancient Greek drama with Moses Hadas, modern drama with Eric Bentley, modern literature with Lionel Trilling, modern philosophy with John Randall and attended the poetry workshops of Leonie Adams. In the late 1950s he returned to Manila and met Jaime Gil de Biedma (the Catalan poet) and the painter Fernando Zobel de Ayala, who became the earliest patrons of his art. In 1960s Paris, the French philosopher Gaston Bachelard introduced his performance ‘Brother of Isidora’ at the Academy of Raymond Duncan, later, Louis Aragon would introduce another performance and finally, Marcel Duchamp honoured him with a ‘medallic’ object. His work was included in Harald Szeemann’s exhibition ‘Weiss auf Weiss’ (1966) and ‘Live in Your Head: When Attitudes Become Form’ (1969) and in the DOCUMENTA 5 exhibition in 1972 in Kassel.